Summary: One day in 2009, twenty-four-year-old Susannah Cahalan woke up alone in a strange hospital room, strapped to her bed, under guard, and unable to move or speak. A wristband marked her as a “flight risk,” and her medical records—chronicling a monthlong hospital stay of which she had no memory at all—showed hallucinations, violence, and dangerous instability. Only weeks earlier, Susannah had been on the threshold of a new, adult life: a healthy, ambitious college grad a few months into her first serious relationship and a promising career as a cub reporter at a major New York newspaper. Who was the stranger who had taken over her body? What was happening to her mind? 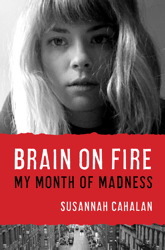 When I first received a copy of BRAIN ON FIRE: MY MONTH OF MADNESS by Susannah Cahalan, I wasn't exactly sure that it appealed to me. I like the occasional memoir and thought the story sounded kind of/sort of interesting, but it wasn't screaming out to me so I put it aside. And then, I started seeing a lot of magazine features and reading some positive reviews; and I started seeing the story in an entirely new light. I actually dropped another book I was reading to pick up this one! All I can say is "Wow! What a story!" I had no idea how gripping this novel would be. BRAIN ON FIRE is about Susannah Cahalan, a young woman who was working as a reporter for the New York Post and seemingly had it all. When Ms. Cahalan started to exhibit some flu-like symptoms, she wasn't all that concerned. However, her health quickly deteriorated and she descended into a month of madness where she nearly died! She became very ill and even paranoid, had seizures, and eventually became psychotic and catatonic. Doctors had absolutely no idea what was wrong with Ms. Cahalan. MRIs and other tests kept coming back as normal and her symptoms weren't consistent with any known disease. It wasn't until a brilliant neurosurgeon Dr. Najjar was put on her case that Ms. Cahalan was finally diagnosed with a newly discovered and rare autoimmune disorder that attacks the brain. (He got his first clue through a very basic test that asks a patient to draw a clock!) Fortunately, the medical team was able to then treat Ms. Cahalan and she returned to normal. She has has virtually no memory of her hospital stay or that month of madness; however, she pieced together stories from doctors and relatives, hospital records, and even video to tell her incredible story. Do I even need to tell you how terrifying this book was for me to read? Ms. Cahalan's story could happen to anyone... anytime for no apparent reason; and don't think I wasn't constantly thinking of that as I read BRAIN ON FIRE. In fact, I'm sure the next time I'm sick, I'll convince myself that I have this autoimmune disorder. Of course, my heart went out to Ms. Cahalan and her family for having to experience these horrors; and I found her story about the doctors' plight to solve her medical mystery to be fascinating. Needless to say, I was riveted to the book. It just goes to show that real life is stranger than fiction! Besides being blown away by Ms. Cahalan's personal story, I was surprised by how much this book made me think. First, Ms. Cahalan appeared to be suffering from some sort of mental illness, and I have no doubt that most medical professionals would have just written her off. (There is no doubt that some luck played into the picture for Ms. Cahalan!) I immediately started to wonder how many people who seem to be suffering from mental illnesses are actually suffering from autoimmune diseases? Ms. Cahalan's disease was relatively newly discovered and I can bet that there are many individuals living in mental institutions that can be cured if we only knew what was wrong with them. In addition, BRAIN ON FIRE made me rethink many of my views about mental illness. Just reading about the horrors that Ms. Cahalan and her family faced made me so sad and even sick to my stomach. I have a profound respect for people dealing with mental illness whether it be personally or as caretakers; and I can't rave enough about the hospital workers that dedicate their lives to helping others. And finally, I can't stop thinking about the wonderful support system that Ms. Cahalan had in place. Her family and friends were truly remarkable, and I have no doubt that they played a major role in her recovery. But what was even more special to me was her boyfriend. He stood by her through some pretty horrific times and they had only been together for about half a year. What a fantastic, stand-up guy! BRAIN ON FIRE would make a terrific book club selection. It's non-fiction which would be a plus as far as I'm concerned because my group rarely reads any true stories. In addition, there are so many interesting things to discuss from the medical aspects, to how her family (and boyfriend) coped, to how Ms. Cahalan was able to recover (both physically and mentally) from her experiences. Some other topics include memory, family dynamics, the meaning of the title, faith, suffering, and of course mental illness. BRAIN ON FIRE truly amazed me from the very first paragraph. Highly recommended! Woah, this story disturbs me to no end. Now, I'm wondering how drawing a clock can help with a diagnosis of an unknown disease! You had me as soon as you said memoir. This sounds like just the kind of book I love! I knew autoimmune disorders can do horrible things to the body but I never knew they could affect the mind. Talk about scary! Wholeheartedly agree. By far one of my favorite memoirs of the year. This sounds amazing! I love medical memoirs, so this one is going straight to my wish list. This was so good -- but really scary. I told Mr. BFR that if I ever lose my mind, he needs to make sure someone checks for autoimmune disorders.